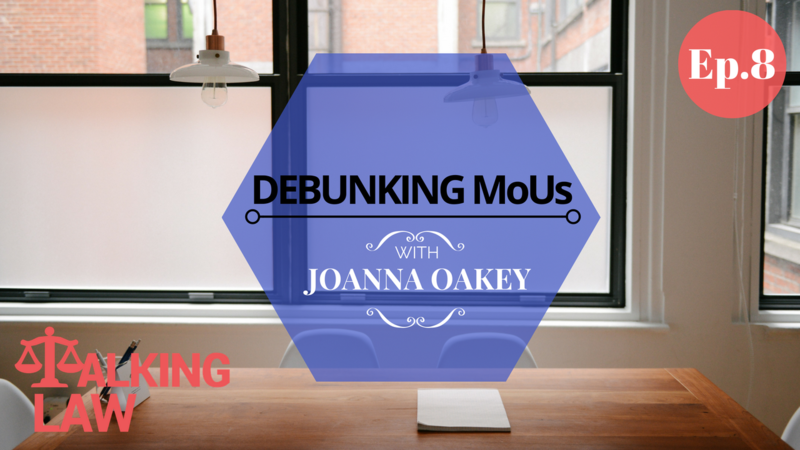 In this episode we share some helpful tips and insights on the ins and outs of MoUs. Memorandums of Understanding (often shortened to the acronym MoU) are documents that are widely used in commercial settings – so today we delve into what they are, what they should contain and the sorts of risks that you should be aware of in using them. Hi, this is Joanna Oakey here and welcome back to Talking Law. Today, we are talking about MOUs or Memorandums of Understanding. If they aren’t legally binding, then what might be the point of having them. Why are we talking about this today? Often I’m approached by people who are confused by what some of these document terms mean and whether or not these types of documents that they’ve entered into are binding. Today we’re going to be talking about these types of agreements, whether they are binding or not, what other things they might be called and what they’re all about. So what is an MOU? 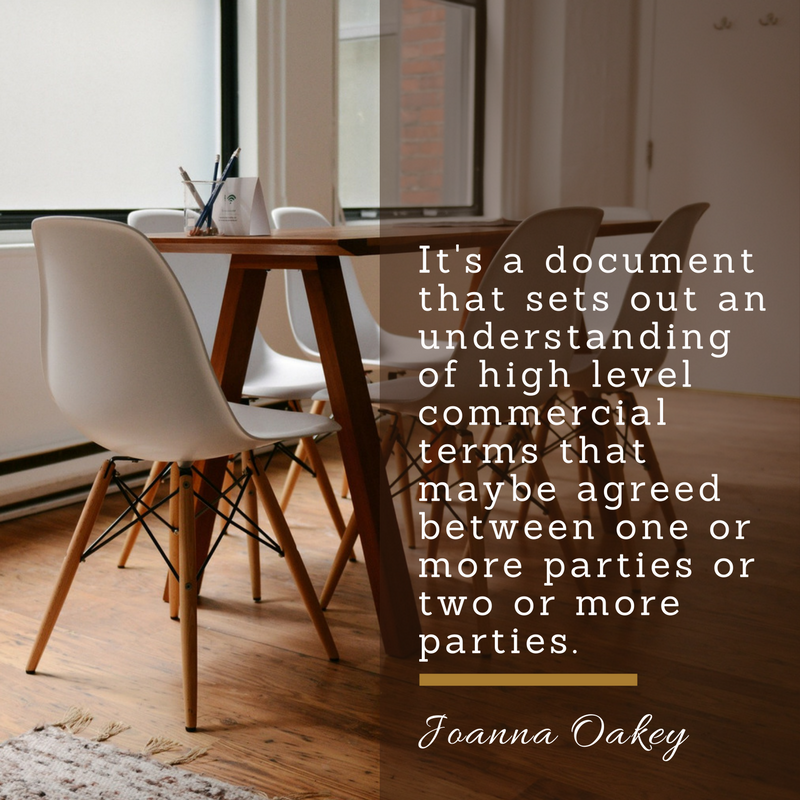 An MOU is a document that sets out an understanding of high level commercial terms that maybe agreed between one or more parties or two or more parties. There might be other ways to describe this document though. Sometimes people talk about Letters of Intent and they often find that these are like MOUs or Heads of Agreement, but in a letter format. Another way to refer to it is Heads of Agreement which is a document that sets the commercial terms of an agreement. It might also be called a Terms Sheet or Commercial Terms. All of these names can mean basically the same thing, a document that’s not a long formal agreement but sets out the structure or the commercial terms of an agreement that two or more people have reached. Sometimes there might be three parties or more. The next question then is – is this document legally enforceable, legally binding? This is, what I think, the most important question for you to bear in mind. You can have three types of documents. (1) You can have a document where you agree. You have an agreement to agree on something in the future. What that might mean is it’s a document where you have with you what you call a Memorandum of Understanding or MOU or a Letter of Intent or Heads of Agreement or whatever. A document where you’re setting out something that you have agreed on now, but that you don’t intend to be bound to in the future; that you actually intend in the future to enter into an agreement, if you can agree on the terms and if your lawyers can agree on the terms that go into a longer and more formal document. That’s one potential use of these Memorandum of Understanding documents. (2) Another approach is that you might have Memorandums of Understanding that are intended to contain terms that everyone must be bound to. Sometimes this is done because parties might want to start a project but they haven’t had the time to enter into a more formal contractual process. Say for example, it might take time going to their lawyers to draft it up, it might take time to get internal board signage or board approval or there might be other reasons for adopting this approach. If that is the case, if you have a document where you intend that you’re going to be bound to various simple terms, one of the risks that you run in this type of document is that because you haven’t entered into a longer more formal agreement, you haven’t had the opportunity to think about what sort of clauses you would include in a longer and more formal agreement. Often we see in these short documents (the MOUs, the Commercial Term, the Letter of Intent, the Heads of Agreement, whatever you call it) discussion about pricing and the way that things will be approached, but not details about things like intellectual property ownership or indemnity or how risks in an arrangement will be shared between the parties. Therefore, it can be quite dangerous for you to enter into an MOU that is binding in all terms. But it’s something that you can do if you intend. Of course, it’s very risky if you’ve entered into an MOU that have the consequence of being binding but you haven’t realised that it’s binding. We’ll talk soon about how you can ensure that these documents aren’t binding if you don’t intend them to be. (3) Now the third type of approach that you might have to your preference of enforceability of this document is that you intend for some of the provisions of the document to be enforceable and some of them not to be enforceable. An example of that type of situation is if you have decided that you want to set up the commercial terms of a deal, that you don’t want to hold either of those parties to those commercial terms until you had the chance to put in place a more formal agreement; but that you do want to hold one of the other parties or both parties to confidentiality obligations for example, or restraint in that they can’t go and deal with other people during the term that you’ve set for the period of time that you need to get a more formal agreement in place. In that case, where you have some clauses that relate to a deal that you hope to do and some clauses that you intend to be enforceable (so as I said in that example we’re talking about confidential clauses, with confidentiality clauses being binding, for example requiring that the other party doesn’t divulge information that you pass over to them in the period of time that you’re working on moving the deal to a more formal arrangement or it might be confidentiality in relation to the deal itself), you might not want the other party to be talking about the deal terms that you put in place in this document. You also might, as I said, want to consider a restraint. Say for example, you might want to say during the period of time that you’ve allocated for the parties to the term sheet to enter into a formal agreement, you want to ensure that neither of you are speaking to other parties at the same time about entering into a commercial agreement that relates to the same deal. Say for example, if you’re looking at potentially selling a business or getting into a joint venture deal or getting into a particular environment where you’re looking at selling goods or services, if you’re in that position of wanting to ensure that some of the terms are enforceable and some are not, you also need to be clear that you have done that in the right way to ensure that you have created enforceable terms in some areas and that you haven’t committed yourself to an enforceable and binding contracts in the other areas. We’ve talked about what types of documents Memorandum of Understanding are and what alternative language they might be called. We’ve talked about whether you want the document to be binding or not. I guess implicit in all of that is that clearly you can have a Memorandum of Understanding that is binding and you can have a Memorandum of Understanding that isn’t binding. It depends which approach you want for you to then create the document that you want because the important thing to bear in mind I think, at the end of the day, it’s not the title you give the document it’s what the document does from a legal perspective after the title. Don’t get too caught up with trying to work out whether or not you’re looking for an MOU or Heads of Agreement or a Deal of Term type format, what you’re really after is understanding what is in the body of the document, whether you’ve included enough information or not, and whether or not the agreement has created a situation where one or both parties abound to the terms of it or not. What do you need to do if you want a document to be binding and enforceable? You essentially need to make sure you have clauses within that document to make it very clear that the provisions of the document are enforceable; or you might instead say that certain provisions of the document are enforceable and certain provisions aren’t. That way you’re very clear about which bits of the document you want to be able to enforce or not. If you don’t want the document to be binding, which is generally the default preference and the default understanding of how MOU’s are used, then once again I encourage you to be very clear in the document that it is not binding and it’s not legally enforceable against any of the parties. I think one of the risks for businesses in this area is that some businesses come to me having signed these MOUs and then doing things on the back of their signed MOUs that have created costs or issues for them or commitment for them in another area and then finding out that someone has pulled out of the commercial deal and that they’re not able to take any action against them because the document that they’ve signed is clearly unenforceable. That’s the first thing, if you need your document to be binding, if you are about to go and incur cost on the basis of the commitment of someone in a document like this, you need to make sure that the document allows you to enforce the terms of that contract. If you don’t want it to be binding, as I said, it’s really important that you make sure it’s not. Otherwise, you might sit on the other side of the fence. You might think that you haven’t committed to something, you later on start thrashing through the deal and realise that this is not the right person to do business with, but find that you’re caught in an enforceable contract. Create the document in a way that will reflect that. 1. 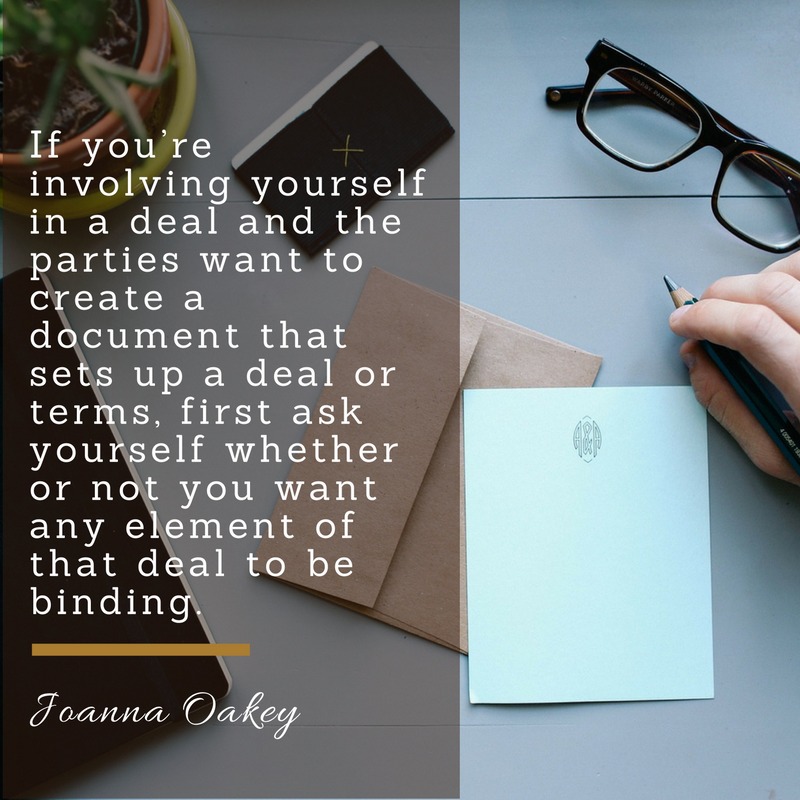 If you’re involving yourself in a deal and the parties want to create a document that sets up a deal or terms, first ask yourself whether or not you want any element of that deal to be binding. 2. If you do, think about what element you want to be binding. Do you want it all to be binding or do you just want certain elements to be binding? 3. Once you’ve gone through that process you need to make it clear in the document what elements are binding. Use appropriate words. If you don’t know what these words are, then make sure you take advice on what the appropriate words are to use in that instance. 4. Make sure, if you are including elements that are going to be binding that you have thought through the detail of that in a clear enough way so that you have given yourself out if there’s an element that you haven’t gone into detail in. You need to be specific and clear whenever you’re dealing with an area that you are creating an enforceable obligation in. Make sure you understand the obligations you’re creating. 5. If you’re intending for it to be binding make sure you have it executed in a way that you can prove later on, as the other party has agreed, to the binding nature of the document. Just a quick recap. In this episode, which was quite a short one, we talked about the areas of MOUs or Memorandums of Understanding. If you’d like more information about this topic, head over to our website at talkinglaw.com.au. We will have a number of free download that relates to this topic and through that website you’ll also be able to download a transcript of this podcast episode if you’d like to read it in more detail. You will also find details on how you can contact our lawyers at Aspect Legal, if you are looking at entering into some sort of deal and you’re considering using an MOU or a Letter of Intent or Heads of Agreement, and you’d like some assistance on making sure that it is reflecting what you need in terms of being binding or non-binding on the other party. And finally, if you enjoyed what you heard today, please pop over to iTunes to make sure you subscribe. We really appreciate it if you leave us a review. Thanks again for listening in! Hopefully we’ve been able to clarify an area that is sometimes a little bit confusing for businesses. See you next time.